Fifteen miles north of Boston is historic Salem Massachusetts. The town was first settled in 1629, almost a year before Boston. Salem was named after the Hebrew word for peace, Shalom. Salem was made famous by the witch trials of 1692. During the 17th century, natural disasters, crop failures, and even accidents were often considered the work of God. Unexplained behavior, sickness, and even birth marks, were considered the work of Satan. Beliefs and fear of the unexplained led to hysteria at Salem in 1692, and the final result was the conviction and execution of 19 people for the crime of witchcraft. These innocent souls were hanged on Gallows Hill. When the hysteria subsided, great doubt was cast on the event due to the number of respectable citizens that were executed. Samuel Sewall, one of the Salem judges, later wrote in 1696 an article of penitence for what had happened. Salem's most famous son is Nathaniel Hawthorne (1804-1864), the short story writer and novelist. Hawthorne wrote the famous novels The Scarlet Letter [explores the moral dilemma of an unwed mother in Puritan times], and The House of the Seven Gables [about a house haunted by the sinful dead]. Salem is a great place to explore. 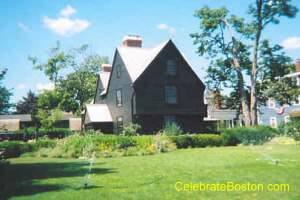 There are several witchcraft related tourist attractions including the Witch House, Witch Dungeon Museum, Salem Wax Museum of Witches and Seafarers, Witch History Museum, and Salem Witch Village. There are buildings dating to the Colonial and Federalist periods, and countless old wooden structures built when Salem was at its height as a seaport and fishing village. The Old Burying Point Cemetery, near the Witch Trial Memorial, contains the remains of a Salem Witch Trial judge and a Mayflower passenger. Salem also hosts a quaint shopping area known as Pickering Wharf. Salem Willows (seasonal), is a small old-fashioned park on the ocean. The Willows hosts some penny arcades, fast food vendors, and a picnic area. Salt Water Taffy is available in a dozen or so flavors; a favorite of North Shore children for generations. If you are walking, the Willows is almost two miles from the station, and a taxi ride should be considered. If you are driving to Salem, there are many old narrow and one-direction streets. Route 114 (east-west), and Routes 107 or 1A (north-south), are the only roads to or from Salem. Follow the route number signs carefully, as it's quite easy to end up in Marblehead or Danvers if you miss a sign! If you are taking public transportation from Boston, the MBTA commuter rail service from North Station will take you to Salem Depot at Bridge and Washington Streets. The National Park Service Visitor Center is down Washington Street, and then down Church or Essex Streets. The Salem Orientation Center is on Derby Street, about a half mile from the station. A good source of detailed information is the salem.org official Visitor's Guide, which is available in PDF format via the link below. Trivia: What was the original Native American name for Salem? Answer: Naumkeak, which translates to The Fishing Place.